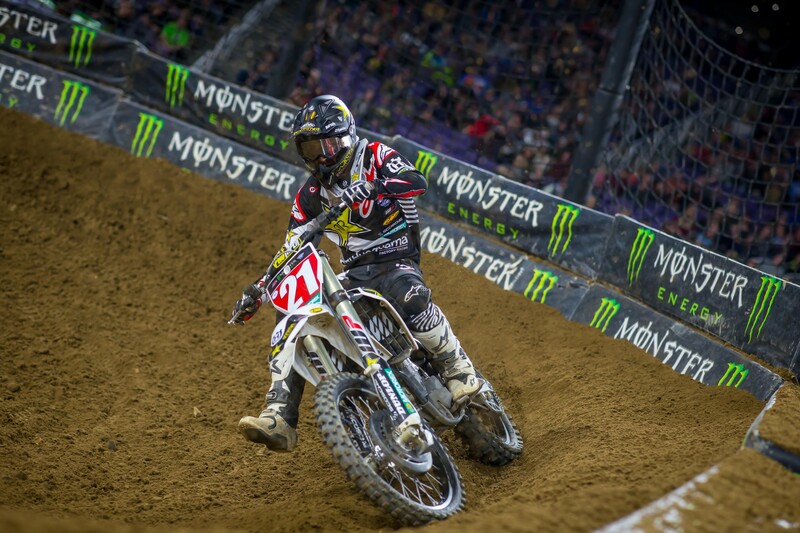 Racer X: Congratulations, guys. You guys have now experienced three Triple Crowns at three separate tracks. Just your thoughts on the format—kind of take us through your feelings now that you’ve experienced it three times. 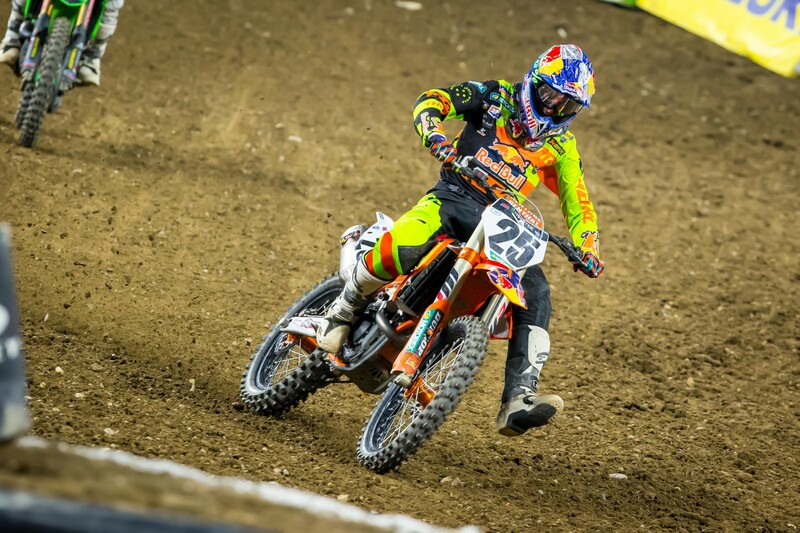 Marvin Musquin: One word, I feel like it’s really intense. That’s all I can say. You got to get a good start. It’s kind of like going out for a heat race, like a sprint heat race. That’s exactly what I didn’t do in the first one. It was kind of like a warm-up for me, and I got better for the second and third one. I’m always glad when it’s over and when I’m safe and on the podium, like today. We fought really hard. It was really intense. We hit each other with the other guys many times. 450 or 250 class, you see a lot of battles. I guess it’s pretty cool for the fans. It’s good until it’s safe for us. If it goes wrong, obviously it’s not good. But we fought really hard and I’m glad we’re here on the podium. Jason Anderson: For me, the triple crown, it’s definitely a lot more action. There’s battling all night. For us, I feel like it’s a lot of more stressful. It’s a stressful night. I think it’s a little bit more risky. Just all of us fast guys on the line. It’s crazy. I guess that’s what the plan was with having the Triple Crown. The fans definitely had some good racing to watch all night. But for us, it is stressful. It’s a stressful night. Eli Tomac: I kind of agree with these guys. Having three starts with all the guys, yeah, it’s good for everyone, but definitely I wouldn’t vote to add any more races or anything of that for next year. So, it’s just like, if the people like it, we can do those three, but definitely no more. Jason, I had been impressed by your talking about collecting points, as you’ve been doing, and getting on the podium and stuff. You kind of said, “I really want to beat this guy, though. I want to win.” Pointing to Eli. You did that in the final main tonight. How do you feel about that? Anderson: I did win the final main, but at the same time, Eli didn’t have to beat me to win the overall. At the same time, it’s hard to say. I did ride good in the last main and it was a good race, but at the same time you don’t really know where it stands. I remember even when I raced Atlanta. The last main, they’re so intense that if you win the overall, you’re collecting points throughout the night, so you’re just trying to maybe play it safe a little bit. We have three more normal races, and I really think I would like to win some more races on the way out. Eli’s speed has been incredible all year, and even Marv. Marv’s been riding awesome. It’s very hard to win straight-up, but that’s the ultimate goal. Obviously, we’re all trying to bring our A-game every weekend. Jason, you got penalized one spot, but as fast as you went down that whole rhythm section, I felt like you were kind of lucky that it was only one spot. What do you think about that? Anderson: In the rulebook it says you’re not allowed to gain positions and you’ve got to enter the track at the safest spot. So, I didn’t gain any positions. I lost five, and I entered at the safest spot. So, the rulebook gets personal preference for those guys, I guess. But doesn’t say it say you’re not supposed to accelerate? Anderson: I wasn’t really accelerating. I was kind of just going the same speed. It’s opinion. 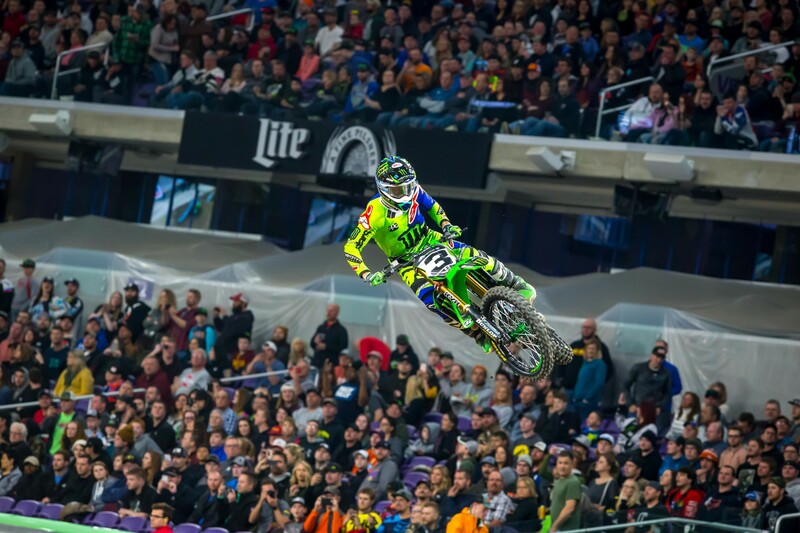 Marvin, we don’t normally see you lose a bunch of positions like you did in that first moto. Can you talk about your struggles there? Musquin: Yeah, for sure. I mentioned it on the podium after the second main when I won. It was definitely not acceptable, but I know what it is. We tried a couple things on the bike. That was not the right way. So, we got better definitely for the second and the third main, and I proved it. It’s a difficult situation. We always try to get better with the bike, and that was not good. Jason, when you think back to early in the seasons and those battles you had, like you won Oakland on the last lap, how different is the racing now? There were so many guys in it. It was so early in the season. Anybody could win. I know you don’t want to go into full point-management mode, but what has it been like living with this points lead for the last almost two and a half months? Anderson: I think the points still for me the hardest part about it is during the week. You just race every weekend and you’re waiting for the next race. Honestly, during the week, you’re thinking about it a lot. But once the race day comes, I haven’t really struggled with it too much because I feel like I go into race mode. My whole goal is, I guess—Bobby always tells me to be the hunter, not the hunted. That should be my outlook every time, but not ask too much of it and try and make a decision. Even like tonight, it’s hard sometimes. With the second race, I was getting way too crazy trying to pass [Justin] Brayton, but those are things you learn from. I feel like I was way smarter in the last one. I don’t know points management, this, that. I’m just trying to race. But the weeks thinking about the championship and stuff is very stressful. But on race days, once you get on the line, you have one goal to get that start and battle with the front guys. Eli, did you know what was going on? You were battling with Marvin and Brayton and then the overall actually swung your way. But did you know that was actually the case there when you were in third? Tomac: Yeah. I knew when Brayton was in front of me, that wasn’t a position I wanted to be in. Then once I got to third, I was like, it’s good enough. Not until the last two laps, I really went into full conservation mode there. So, I was trying to charge behind Marv there, doing what I could. I think we were behind Brayton on the option lane when Marvin got by me. That’s what shuffled me back. We lost touch with Jason and he was gone. Just gave it my all, but that was that. Marvin, talk about that second main. You said you made some changes and improved, but you also started kind of towards the back and made a good charge in there. How many guys did you go though? Musquin: Like I said, it proved that when I got the right balance of the bike, I can do pretty good and I can charge. That’s definitely what I was not able to do in the first main. I don’t like excuses, but it definitely didn’t make me comfortable with the bike. I know I should have maybe made it work, but I didn’t. So, the second one was great. Obviously, Jason made a mistake, but the riding was really good. It felt really good to get into the lead and be myself and charge and start jumping the whoops, stuff like that. That was all me. The third one was also good, considering the bad start. Eli, you just mentioned that rhythm lane before the finish, you got shuffled back. Did something change on the left from the first and second mains because it was a lot slower in the third main? We saw a lot of guys get passed there. It wasn’t that bad earlier in the day. So, was there something different? Tomac: Once race time came around, that on-off was just faster. I think only free practice that left side was even close. I shouldn't have gone there, but I was just looking for an option. I was maybe a little bit too impatient to try to make a move on Brayton in that area, and it cost me. Once again, the split lanes, they never really work out to be a sweet split lane. It’s always one fast line. That’s just the way those go.